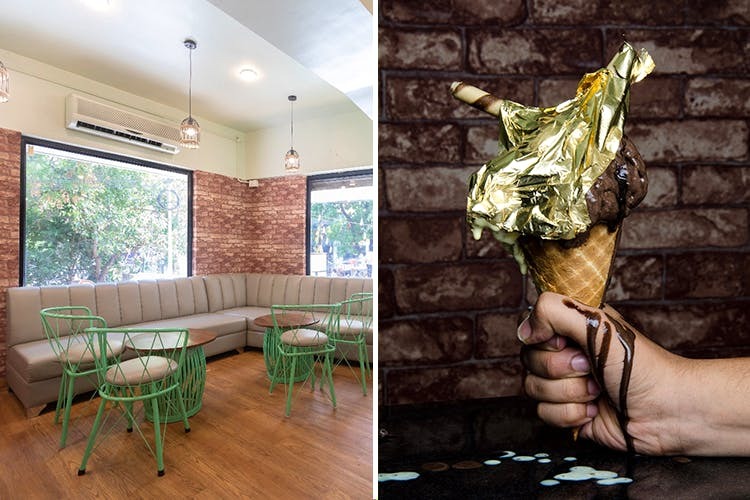 There’s a new dessert lounge on Law College Road and we hear it’s serving mouthwatering sangria, mojito and coffee liquor ice creams. Ti – Amo Gelato Dessert Lounge is the newest ice cream parlour in town and we’ve already heard tons of rave reviews about it. Their exotic range of ice creams is something one must definitely try. From whiskey cream to whey protein and strawberry champagne, their ice cream flavours are worth all your money. Apart from these, they also have some premium flavours like biscatino cookies, banana strawberry cheesecake, bubblegum, Madagascar chocolate, avocado and more. If you’re low on cash, but still got the sweet tooth, go for the fruity ice cream rolls for INR 99. They have a wide variety in it such as custard apple, muskmelon, mango, kiwi and chikoo. People who are big on waffles, order Ti Amo’s decadent vanilla waffle that comes with oreo cheesecake, red velvet, biscatino and vanilla fudge brownie.